QUITO, ECUADOR (November 7, 2014)– The Parties to the Convention on Migratory Species (CMS), at their 11th meeting of the Conference of the Parties (COP) in Quito, Ecuador, agreed today to adopt a Central Asia Migratory Mammal Initiative to protect wildlife in the region from increasing development threats, WCS (Wildlife Conservation Society) reports. The CMS Initiative notes that the enormous landscapes and varied wildlife of Central Asia are under growing threats from a variety of pressures, from poaching to development. Saiga antelope populations plummeted due to poaching by over 95 percent in just 20 years – from nearly 2 million to only about 50,000 animals – but with CMS support and conservation actions by governments and conservation organizations on the ground, the population has begun to rebound and has now reached over 200,000 animals. One of the greatest threats to migratory mammals in this region is linear infrastructure – the increase in roads, fences, and other structures that support the growing development of the region, but that act as barriers to movement of migratory mammals. These movements are critical to survival in this region of long, cold winters and hot, dry summers. Because of this threat, CMS requested WCS to produce a Guidelines on Linear Infrastructure as a first step in the Initiative to provide ways that governments and industry can avoid development actions that may lead to population declines. These Guidelines have also been approved and adopted by CMS at this week’s COP 11 in Quito. WCS works on wildlife conservation in 65 countries around the world. 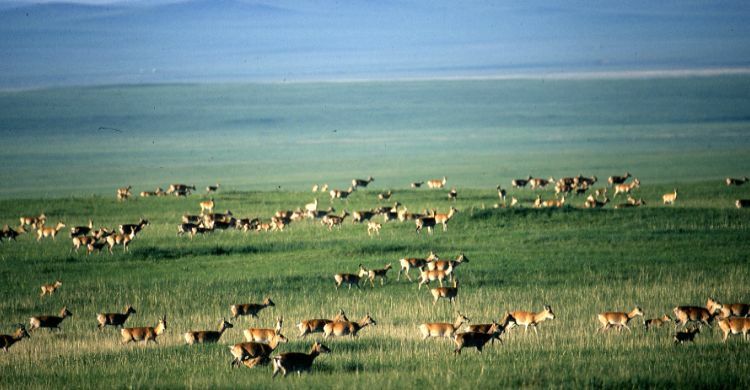 WCS has been helping governments and communities in the Central Asian region conserve a wide range of threatened wildlife included in the CMS Initiative, including snow leopards and argali in Afghanistan; Tibetan antelope, Tibetan gazelle, kiang, and wild yak in the Changtang region of Tibet; Asiatic cheetah in Iran; and Mongolian gazelle, goitered gazelle, Mongolian saiga antelope, and khulan in Mongolia.